We are so excited to share with you our full line-up for the 2018 conference. Over 115 artists, speakers, producers, industry insiders and DJs will be contributing to this year's conference. This line-up was created through collaboration with over 50 different music oriented organizations and collectives and we can't wait to see what magic happens when we all gather at the National Music Centre. And don't forget to buy your pass here! Remember, prices increase when we hit November. 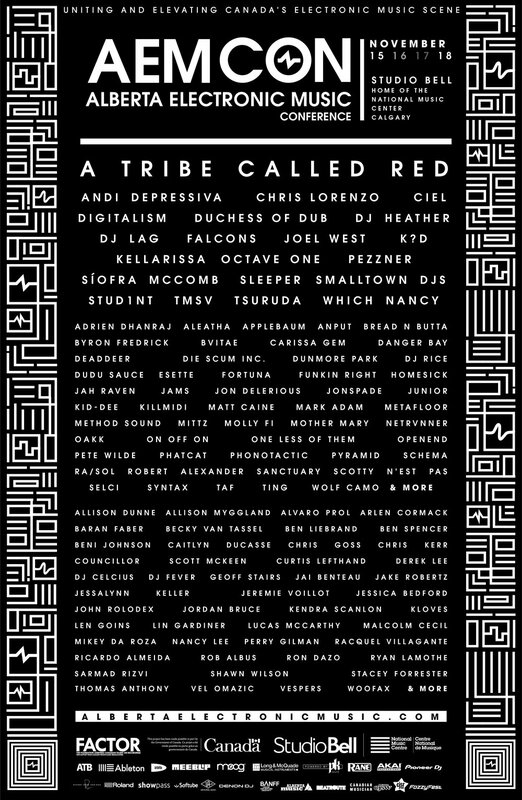 In alphabetical order, AEMCON welcomes A Tribe Called Red, Adrien Dharnaj, Aleatha Applebaum, Andi Depressiva -- owner of German-based record label Gretchen Will Tanzen, Anput, Bread N Butta, Byron Fredrick, Bvitae, Carissa Gem, the UK's Rinse FM host & DJ Chris Lorenzo, CIEL, Danger Bay, DeadDeer, Die Scum Inc., Germany's electro-rock duo Digitalism, DJ Heather, South Africa's Gqom House music pioneer DJ Lag, DJ Rice, Duchess of Dub, Dudu Sauce, Dunmore Park, Esette, LA Producer and Fools Gold act Falcons, Fortuna, Funkin Right, Homesick, Jah Raven, Jams, John Delerious, Joel West, JonSpade, Junior, Billboard's chart-tipping Producer K?D, kiD-Dee, Kill Midi, Kellarissa, Matt Caine, Mark Adam, Metafloor, Method Sound, Mittz, Molly Fi, Mother Mary, Netrvnner, Oakk, Motor City's legendary techno duo Octave One (whose AEMCON performance will mark their first-ever appearance in Western Canada), On Off On, One Less of Them, OpenEnd, Pete Wilde, a true west coast favourite; owner of Hunt & Gather Records Pezzner, Phatcat, Phonotactic, Pyramid Schema, Ra/Sol, Robert Alexander, Sanctuary, Scotty N'est Pas, Selci, Síofra McComb, Sleeper, Calgary's hometown heroes and Mad Decent frequenters Smalltown DJs, New York's influential Discwoman member and multi-instrumentalist Stud1nt, Syntax, TAF, Ting, TMSV, Tsuruda, Which Nancy, Wolf Camo & much more. With more than 100 speakers and performers gathered together for 4 days, there's no better time to immerse yourself in Canada's electronic music culture! Sub Chakra, Dnb Girls, Render, Blueprint, The Junction, HUMPday House Party, New Wave, Afros In the City, Femme Wave, Noctilux Collective, J9 Productions, Studio Social, Dem Modest Kids, Ocil8, 9910 Edmonton, 10at10, Ableton, AKAI Pro, Alberta Music, Bassbus, ATB Financial, BioWare, Blueprint Alberta, Calgary Center for Sexuality, Canadian Musician, Chapel Sound, Cirque de la Nuit, CJSW 90.9FM, C.M.I, Crucial Recordings, Current Symposium, Denon DJ, Dispersions PR, EA Games, E-Town Junglists, F.A.C.T.O.R, Fancy Fox Music, Fozzy Fest, Good Night Out Vancouver, Habitat Living Sound, HBB, Hospital Records, Hunt & Gather, Indigenous Resilience in Music, Junction Bar & Stage, Long & McQuade, Meeblip, Moog, Muzooka, Night Vision Music Academy, Obskur Music, Paradigm Agency, Party Safe, Pioneer, PK Sound, Rane, Relic Entertainment, Roland, Showpass, SOCAN, Society for the Advocacy of Safer Spaces, Studio Social, Ten Speed Audio, The Hifi Club, The National Music Centre, Transient, Universal Audio, Warp Academy, XA Productions, Zephyr Studios, & More.